The best part about borrowing through Marcus is the flexibility. You can choose your preferred monthly repayment amount and loan term on the website and Marcus will design a loan around those requirements. Once you’ve made 12 monthly payments on time, you can skip one payment. It will extend your loan term by one month but won’t add to the amount of interest you’ll need to pay. APR rates with Marcus are very attractive for applicants with excellent credit and loan terms are flexible, between 36-72 months. Marcus is ideal for borrowers with excellent credit who want to escape high fee loans. Let's compare rates, terms and fees for SoFi and Marcus. 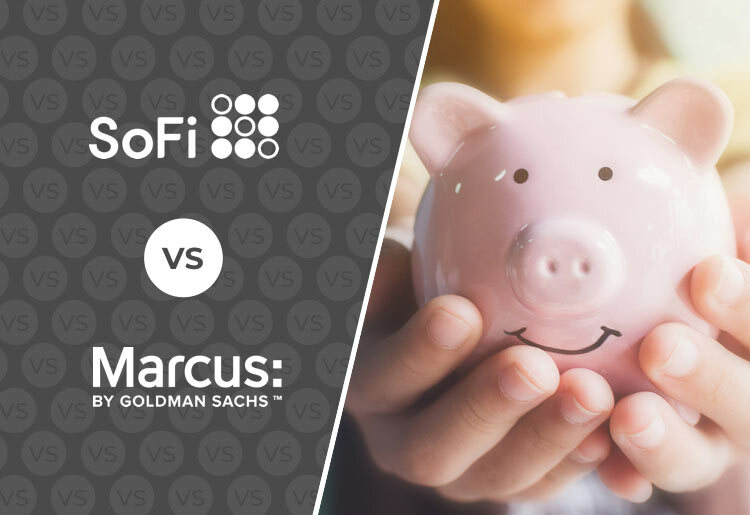 SoFi does offer a much higher maximum loan amount of $100,000 to borrowers that qualify, while Marcus’ top loan amount is only $30,000. However, Marcus lets you borrow from $3,500 while SoFi offers loans from $5,000. APR rates are lower with SoFi, ranging from 5.74% - 16.99% in contrast to Marcus which range from 5.99% - 28.99% **. In terms of eligibility requirements, Marcus requires an established credit history, while SoFi is willing to waive this even though both ask for a credit score of 660+. Both SoFi and Marcus require that you be over 18, of legal age to take a loan in your state and a US citizen. Both lenders also require borrowers to have a job. SoFi and Marcus both require a minimum credit score of 660 and keep the best rates for borrowers with excellent credit, but SoFi doesn’t have any minimum years of credit history or ask for a maximum debt-to-income ratio. It’s willing to work with new borrowers who don’t have any established credit history and will consider them according to their financial history, expenses, income, and career experience. Marcus doesn’t say how long a credit history you need but makes it clear that it’s not for new borrowers. It also asks for a debt-to-income ratio of below 40%.